I was lucky enough to get myself put on the guest list for the opening of the new exhibition at the Hepworth gallery (Thanks Hayley!). Despite the 2-pairs of gloves temperatures, and much faffing trying to find the car park (no thanks Sat Nav) I made it in. After claiming my free drink (part of the art fag tradition) I went straight up to the exhibition, ignoring the speeches so I could get a good un-interrupted look at the work. Walking into the space you are met with a series of what appears to be antique fabrics. On closer inspection, these are painted, ceramic and had cut leather representations of fabric. I was very taken with the leather versions, which you really did have to get very close to before you could figure out what they were! I then went in to watch the Ben Rivers film. He has put together 4 short films about islands and fictional islands to look at the idea of utopia. I will admit that I didn't watch the whole 4, coming in halfway through the screening. You are handed a set of wireless headphones with the films soundtrack playing and go into the space filled with beanbags, cushions and folding chairs (I managed to claim an empty bean bag - left empty as it was directly in front of the projector meaning I had to slump in the chair to avoid projecting my giant head over the screen). The first film I saw was documenting a Japanese psychiatric centre on an island which was starting to decay (your usual art film gubbins, but not too interesting). The second film was about the fictional island of 'Somerset' which was inhabited by primitive natives in creepy wooden/found object masks. The soundtrack discussed the history and traditions of these people and was a much more successful piece in my view. I later found out that the soundtrack was written without seeing the finished film, which explains the disjointed elements of the film, but also added a sense of confusion which was in keeping with the images on screen. By far and away my favourite was the collaboration between Heather and Ivan Morrison, who were exhibiting a collection of objects which are complimented and used as part of a puppet show. The objects all appear to document some form of decay, from a collection of carved animal bones to paintings created with burnt bone dust and soot. There is also a metal stool which is being slowly dripped with water from above which will gradually rust over the course of the exhibition. This is quite startling at first, as my first impression was that something must be leaking from my bag! The story of the objects will be shown through interaction with the puppets, and is a story about the loss of a child, who is represented here by a giant floating ball of light filled with helium. 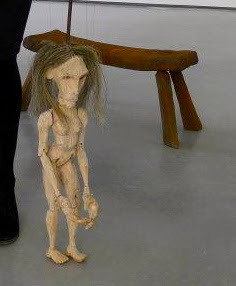 Sadly the puppets weren't in action on the night, but were hanging up in the Hepworth reception area. They have been hand carved, and correlate to the massive paintings displayed in the gallery space (grey for Anna the protagonist and Black for the man). I will be going back to see the puppet show in a few weeks so will be able to expand on this review then. At the moment, I think that the objects are very interesting apart from the puppets, and am intrigued to see how these creations interact. Overall, this is a very different show to the Eva Rothschild exhibition which opened the Hepworth. It is unified by the themes of utopia/dystopia, but without the additional explanations I had before and after looking at the work I think that this may be missed by some visitors. However, I would definitely recommend it!